In many ecosystems soil quality is good, measured in terms of soil pH. But soil pH in parts of grasslands and marsh ecosystems is not yet within acceptable levels. In all ecosystems soil pH on average is slightly decreasing which means these soils become slightly more acidic. The soils in natural areas can become more acidified as a result of the deposition of acidifying substances in the atmosphere, which can lead to the loss of certain plant species in these habitats. The trend lines show that the pH of the soil is decreasing slightly in all ecosystems across the country. This acidification may be due to natural succession and due to the acidifying effect of nitrogen deposition. Soil pH is classified moderate or bad in about a fifth of the total area of natural and semi-natural ecosystems. Locations where soil pH has been found moderate or bad are mostly situated in semi-natural grasslands and marshland. In forests, and to a greater extent in dunes and heaths, the environmental conditions in terms of soil pH are generally good. One of the causes of acidification is nitrogen deposition. Atmospheric deposition of acidifying substances causes acidification of the soil in natural areas, leading to a decline or loss of plant and animal species in those areas. Soil acidity can also be influenced by changes in the water management regime, for example if the supply of base-rich seepage fails or through the accumulation of organic matter in the humus layer. The latter is a problem in marshland. The accumulation of organic matter (natural ageing) leads to a lower groundwater level and as a result the influence of rainwater is increased. The marsh becomes slightly drier, nutrient poorer and slightly more acid. Direct measurements of soil and water pH can be used as indicators to determine changes in environmental conditions and whether or not current conditions are suitable for the sustainable conservation of ecosystems. However, the availability of such measurement data is limited. Environmental conditions can also be estimated indirectly from the presence of certain plant species and changes in species composition, because plants have specific environmental requirements. The vegetation composition found in an area is therefore indicative of the prevailing environmental conditions at site level. A complicating factor is that vegetation responds later to changes in pH than, for example, soil chemistry. 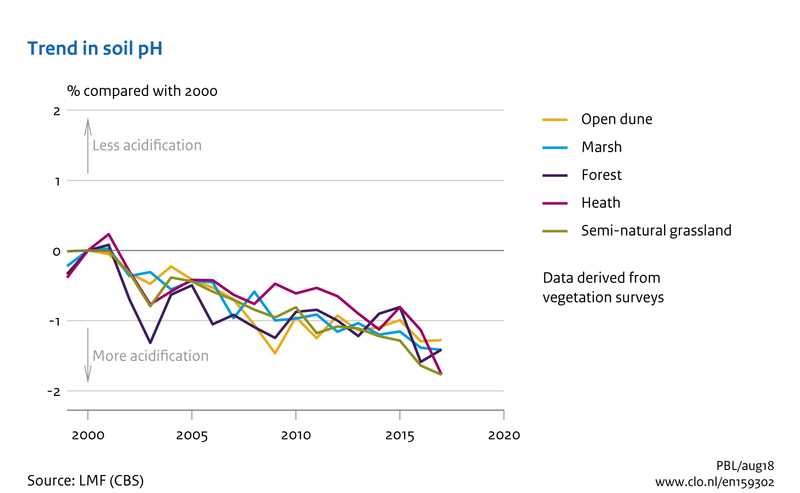 It is possible that improvements in vegetation composition are not materialising, and in some cases vegetation composition is even deteriorating, because environmental pollution is still too high and has not declined at all in recent years. In the 'Monitoring and evaluation methodology', the provinces and conservation management organisations have set out how environmental conditions can be determined. In anticipation of the first set of monitoring data from the provinces, these and the two indicators below illustrate current environmental conditions. The Netherlands has international commitments to meeting the goals of the Convention on Biological Diversity, the Birds and Habitats Directives (Natura 2000) and the EU Biodiversity Strategy. In the Nature Pact (Natuurpact) the national and provincial governments have agreed to improve ecological quality through the creation of the national ecological network and through more intensive restoration and management measures to improve water and environmental conditions. To prevent the effects of eutrophication and acidification, Dutch environmental policy focuses on reducing emissions of eutrophying and acidifying substances in the Netherlands and surrounding countries. Over the last few decades, both national and international environmental policies have led to cleaner air, resulting in lower acid and nitrogen deposition on ecosystems (Van Herk et al., 2002; Buijsman et al., 2010). Research shows that this reduction in deposition of acidifying substances has resulted in a much slower rate of acidification in acid-sensitive sandy soils than before. However, the results achieved are not yet sufficient to produce good conditions for ecosystems and species. Soils are still becoming more acid as a result of ammonia deposition and natural succession, but this is of a much lower order of magnitude. In the Nitrogen Reduction Programme (PAS) a combination of generic and area-based policies are being applied to reduce nitrogen deposition on Natura 2000 sites. In addition, resources are being made available for restoration measures in existing natural areas to combat eutrophication and acidification. Many of these measures are also aimed at combating water table drawdown, and prevent the drying-out of areas. This is because current soil acidity levels depend not only on the current deposition of eutrophying substances, but also on the lowering of the water table and on the quality of surface water and groundwater. Buijsman, E., J.M.M. Aben, J.P. Hettelingh, A. van Hinsberg, R.B.A. Koelemeijer & R.J.M. Maas (2010) Zure regen. Een analyse van dertig jaar verzuringsproblematiek in Nederland. PBL Bilthoven. Dobben, H.F. van, R. Bobbink, D. Bal en A. van Hinsberg (2012). Overzicht van kritische depositiewaarden voor stikstof, toegepast op habitattypen en leefgebieden van Natura 2000. Wageningen, Alterra, Alterra-rapport 2397. Herk, C.M. van, Aptroot, A. & Van Dobben, H.F. (2002) Long-term monitoring in the Netherlands suggests that lichens respond to global warming. Lichenologist, 34, 141-154. Ministerie EZ (2013). Kamerbrief Natuurpact. Ministerie van Economische Zaken, Landbouw & Innovatie, Den Haag. Ministerie van LNV (1990). Natuurbeleidsplan. Regeringsbeslissing. Ministerie van Landbouw, Natuurbeheer en Visserij. Den Haag. Sanders, M.E., G.W.W Wamelink, R.M.A. Wegman &, J. Clement (2016). Voortgang realisatie nationaal natuurbeleid. Technische achtergronden van een aantal indicatoren uit de digitale Balans van de Leefomgeving 2016. WOt-technical report 79. WOT Natuur & Milieu, WUR, Wageningen. Wamelink, G.W.W., Adrichem, M.H.C. van, Dobben, H.F. van, Frissel, J.Y., Held, M. den, Joosten, V., Malinowska, A.H., Slim, P.A. & R.J.M. Wegman. (2012). Vegetation relevés and soil measurements in the Netherlands; a database. Biodiversity and Ecology 4:125-132. Wamelink, G.W.W, Goedhart, P.W., Dobben, H.F van & F. Berendse (2005). Plant species as predictors of soil pH: replacing expert judgement by measurements. Journal of vegetation science 16:461-470. Wamelink, G.W.W., P.W. Goedhart, J.Y. Frissel, R.M.A. Wegman, P.A. Slim & H.F. van Dobben (2007). Response curves for plant species and vegetation types, Alterra Report 1489, Alterra, Wageningen. CBS, PBL, RIVM, WUR (2018). 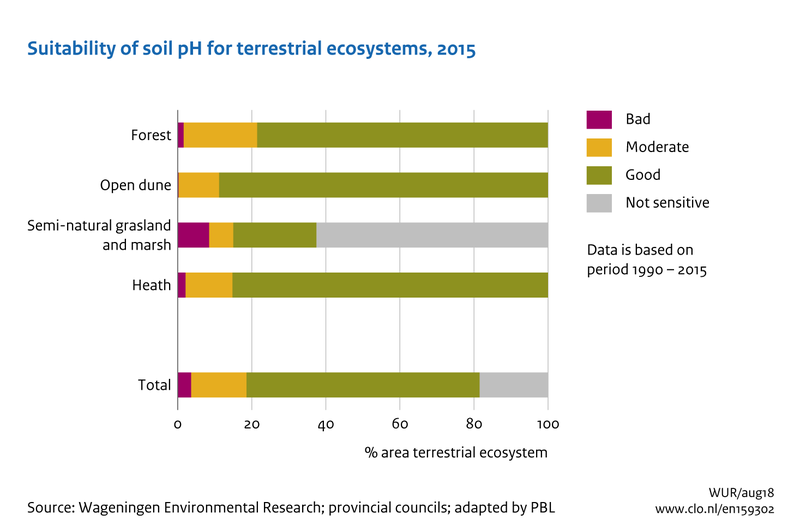 Ecosystem quality and trends in soil pH, 2017 (indicator 1593, version 02 , 5 December 2018 ). www.environmentaldata.nl. Statistics Netherlands (CBS), The Hague; PBL Netherlands Environmental Assessment Agency, The Hague; RIVM National Institute for Public Health and the Environment, Bilthoven; and Wageningen University and Research, Wageningen.